Seems a bit ironic that there are some Doctor Who fans out there that need to be dragged kicking and screaming into the 21st Century. Lighten up folks. Tom Baker is not the Doctor anymore. Seems as though much of the UK is in an uproar this week after the long-awaited premiere this past weekend on the BBC according to this story in Monday’s Telegraph. Putting all this aside, the reviews have been great for the much-anticipated premiere. From what I’ve been able to see so far, we are in for a great ride courtesy of the brilliant mind of Steven Moffat as he continues to push the envelope along with a stable of some pretty incredible writers that have been assembled for this first post-David Tennant season. Somehow, the words of Douglas Adams come to mind from The Hitchhiker’s Guide to the Galaxy – Don’t Panic. The Doctor is still in a tweed jacket and a bow-tie. It all balances out in the end. 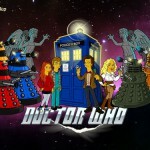 Is Sophia Myles the new companion for Doctor Who? Except that long-time viewers will remember that there WAS a large wardrobe in the TARDIS. Or maybe it’s just those of us old as dirt that remember the Tom Baker and Peter Davison eras. 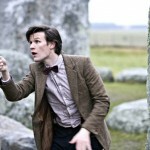 KERA – is Doctor Who coming back soon to our favorite PBS station? I LOVE the no commercials and combination with DW confidential. Julie and Cora, I also remember the TARDIS wardrobe and like watching commercial free-“Who” along w/ “Doctor Who Confidential.” The Smith era should be interesting, from what I’ve seen from the trailers, and the last few minutes of the last episode on another channel. @Julie, Cora and Lisa C.: I definitely remember the wardrobe in the TARDIS, but couldn’t remember if it was the Tom Baker episodes or not. Thanks for verifying. I just can’t believe all the uproar in the UK over this. You’d think the ones complaining would remember this isn’t new. Some people have vowed never to watch the series again, which seems a little bit over the top. FYI, the good Doctor will be back in May on KERA. Have to spend a couple of weeks making up the MI-5 repeats that we missed during March pledge. If I remember right, will back on first Sat. in May with both the show AND Confidential….uncut and uninterrrupted. Can’t wait to see the premiere on 4/17 on “another channel”. p.s. Put your cane down, Julie. You’re in good company. Thanks for the info! I’d been looking ahead on the schedule and wondering when it would be back, tho’ I watch “MI-5” too (and generally on Thursdays). There was a bit of a dust regarding the more trendy aspects of the premiere, but you know I think the bottom line was there were a lot of people still miffed about David Tennant leaving and there’s no pleasing them. Every Doctor is suppose to be different with his own twist. I will watch the “new” Doctor on another channel next weekend, but I am also looking forward to the return of DW on my favorite local PBS station. Thanks Mr. Young for the info about the return. Maybe a little late with this comment, but wasn’t there also a wardrobe in the TARDIS in the Christmas Invasion episode just before David Tennant’s Doctor and Rose are going to Christmas lunch with her family? And where did Rose get her new clothes in the first series when they went to meet Charles Dickens? I think MariLeigh is right and the only reason people are picking the new series apart is they’re unhappy with change. I am really looking forward to the new Doctor Who. 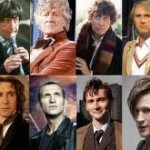 The commercials on “the other channel” look exciting and Matt Smith looks like the Doctor is supposed to look. He was great in both the Sally Lockhart Mysteries! I swore I’d never watch it after Christopher Eccleston left, then swore I’d never watch it after David Tennant left… But then you realize that the fun of Doctor Who is the thrill of the adventure and that can’t happen unless you take a bit of a risk. Celeste – so true about the fun of DW. I was ill recently and decided I needed to watch something other than talk shows to keep me entertained. I pulled out several episodes of “The Key to Time” and just laughed at how “bad” it was. Tom Baker’s delivery of certain lines was just over the top. The sets! But, good reminders of why the show has lasted nearly 50 years! Cora – I do the same thing. For some reason Doctor Who always makes me feel better! There is something so funny about watching dated sci-fi series, especially when they are trying to be serious. (Buck Rogers was another one that I love that makes me laugh) Really excited to see what the new season’s like! The very first show of the new series, broadcast on Saturday, featured a kissogram, a naked Physician and a “sexed up” Tardis.Throughout the special 65-minute episode, The Eleventh Hour, in which Doctor Who had 20 minutes to save Earth from aliens identified as the Atraxi, his new companion, Amy Pond, was revealed as a kissogram dressed in a skimpy policeman’s outfit, complete with mini-skirt and handcuffs. In one scene, Amy, played by the actress Karen Gillan, told the Dr that her kissogram repertoire also included nuns and nurses’ outfits. Uncover out additional at Sci Fi Fan.